Sometimes, when travelling, you get a longing for something that reminds you of home; something akin to a comfort zone to ease the pangs of homesickness. Like craving for the feel of denim on your legs after weeks of wearing travel pants, or a taste of cuisine close to your mother’s cooking. So it is while in the middle of a city that offers you cuisine as diverse as its population, that I get a craving for, yep, instant noodles. Nothing like a bowl of [tag]Mee Goreng[/tag] to get you through your day. Next time, I’m buying me some instant ramen. that just made me soooo hungry. Did you make THAT? How do you make that? Looks so damned good. I’d eat it through my computer screen, if it was possible. Dude, it was instant noodles! :P It’s one of our favorites, though I don’t put in the sambal/chilli (which takes away its mee-goreng-ness). I just pan-fried the egg and voila! Instant mee goreng! That reminds me…I must buy some more! Hi! 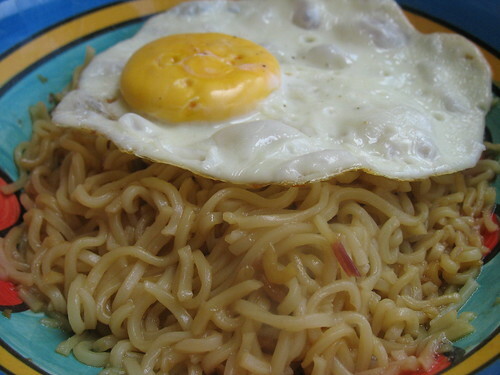 Do you guys know where I can buy instant mee goreng here in the Philippines? Thanks!